Green space abounds in Chanute! Santa Fe Park is the largest of the five parks in Chanute. It contains six ball diamonds (three youth, one baseball and two adult softball), horseshoes, sand volleyball court, playground equipment, fishing, boating and picnic areas and shelters - and a dog park is in the works! And from May-October the local farmer's market is held Wednesday afternoons and Saturday mornings. Highland Park is home to several WPA picnic structures as well as wonderful fountain that changes colors and provides a colorful glow to the park's sunken garden area. 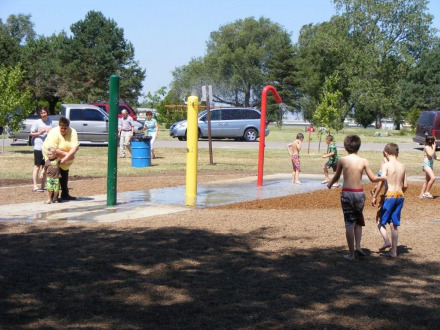 It also has an accessible spray park free of charge. If you enjoy checking out WPA structures, visit Katy Park to see the concession stand and baseball stadium. Teenagers will find a skate park located in Katy. Central Park houses a large enclosed pavilion that can be rented for family reunions and other events. 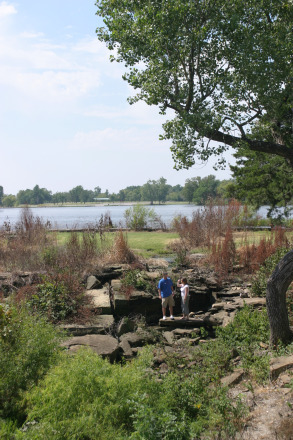 Cross Park is located in the middle of one of Chanute's most historic neighborhoods. Be sure to visit the historic Austin Bridge when you are at Santa Fe Park. The King Bridge Company constructed the Austin Bridge in 1872. The 160-foot bowstring arch design spanned the Neosho River east of what is now Chanute. Local pioneers invested $15,000 for their economic future to build the bridge to get livestock and crops to the railhead. In 1910, the bridge was moved downstream to the community of Austin. On September 15, 1977, the bridge was added to the National Register of Historic Places. In August of 1999, the bridge was moved into Santa Fe Park to become the southern terminus of a 3.11-mile hike/bike path. The public golf course, Stone Creek, is located on the west side of town. The Maring Aquatic Center has a large diving and swimming pool, a slide and a lazy river and children's play area.